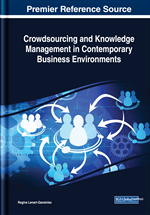 Crowdsourcing is a relatively new concept, which was defined for the first time only in 2006. The growing interest in crowdsourcing has been observed since 2010. As of that moment, the number of publications on crowdsourcing has been systematically increasing. The researchers' attention is frequently focused on the benefits possible to be obtained by the organization owing to crowdsourcing. Not without importance is the issue of cooperation with the crowd. Despite the growth tendency, it may still be ascertained that the multitude and diversity of approaches to crowdsourcing does not increase the chances for clarification and transparency. In their majority these papers are of a theoretical nature and rather dispersed and fragmentary. As a whole they do not make reference to the achievements of the predecessors. The subject of this chapter is searching for an answer to the question whether crowdsourcing displays the features of a public management fashion. Management fashion is defined in various ways, inter alia, as a transitory collective belief (Abrahamson & Fairchild, 1999), “the production and consumption of temporarily intensive management discourse, and the organizational changes induced by and associated with this discourse” (Benders & van Veen, 2001, pp. 48-49). It is also defined as “managerial interventions which appear to be innovative, rational, and functional and are aimed at encouraging better organizational performance (Carson et al., 1999).